Threepointplay: 2014-15 Immaculate - 'The Dream' additions. 2014-15 Immaculate - 'The Dream' additions. I took delivery of another batch of recent 2014-15 Immaculate purchases today. 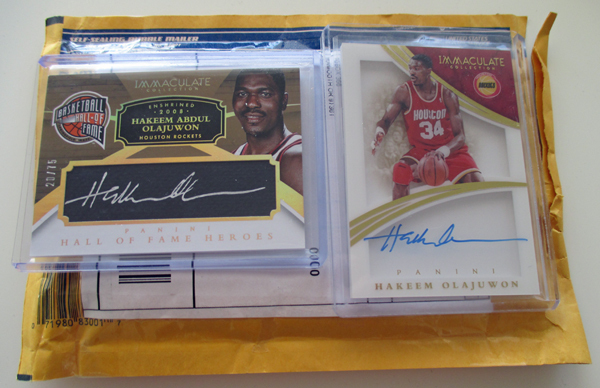 In amongst the cards I received were two of the legendary Rockets centre Hakeem 'The Dream' Olajuwon. 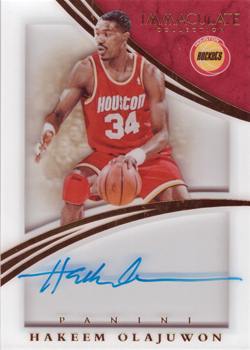 Despite winning back-to-back NBA Championships, both the NBA MVP and Finals one, and making 11 All-Star appearances, Olajuwon rarely received the love from the hobby than less successful players that played the game in the 1990s. Even today his cards are priced lower than the likes of Anfernee Hardaway, Tracy McGrady and Karl Malone, who did even come close to achieving that success that this versatile Nigerian center achieved in his 18-year pro career. The advantage that this state of affairs to those collectors who are interested in his cards, is that they can be picked up pretty cheaply. The two cards pictured feature on-card autographed and serial numbered cards were obtained for a combined cost of $75. 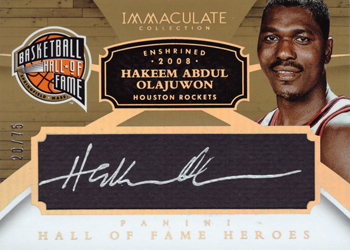 I am currently on the look out for the Olajuwon NBA Champions insert, to complete my collection of the on-card autograph / memorabilia from this years Immaculate release.